How I got this Watch: I contacted Bremont to request a watch for review and was sent the Boeing 100 GMT. I wore the watch for two weeks before returning it. This is not a paid review. It's matter of personal taste as to how you feel about Bremont's collaborations as now pieces from HMS Victory, Bletchley Park, the Wright Flier and Team Oracle's sail boat have all been included inside a limited edition watch over the past few years. Whilst branded partnerships from other watch brands can lead to some truly head-scratching what were they thinking moments, Bremont's collaborations are typically a little more reserved; the 'including a piece of X' gimmick might not to be your taste but thee partnerships are well chosen and suit the Bremont style as well as the company itself. Aviation is a core element of Bremont's history with founders Nick and Giles English both being avid pilots and seeing that the Bremont design brief is a modern re-interpretation of the classic pilot's watch, the Boeing 100 feels right at home. Limited to just 300 pieces, the Bremont Boeing 100 is a celebration of Boeing centennial anniversary in 2016 with the aerospace company's 1930s logo placed at the 3 o'clock position on the dial and the relevant dates (1916-2016) written on the bottom chronograph register. The vintage logo has little resemblance to the current logo which Boeing has used since 1997 which further strengthens the legitimacy of this watch being designed for pilots and aviation fans as it would take a real plane geek to recognise the logo at first glance. The current Boeing logo and wordmark are engraved on the caseback at the 12 o'clock position. A downside to using the larger vertical logo on the dial is that Bremont's own name and slim propeller logo are relegated to the top chronograph register so are often hidden behind the central seconds or hour and minute hands depending on the time. I'm not one for caring about branding on my watch so it's hardly the most damning compliant but it's a point worth noting as previous partnership watches had the Bremont name more prominent. I will admit that a brown dial would never be my first choice for a watch and I imagine that Bremont sales staff have got an uphill battle trying to convince consumers to go for the slightly unusual color but over time, the metallic brown really did grow on me. The brown wasn't an arbitrary attempt to broaden Bremont's color palette, rather it was inspired by the color scheme used in older Boeing cockpits which supposedly created a more relaxing environment for pilots compared to standard black. The USSR also attempted a similar experiment by painting their cockpits a bluey-green which aimed to reduce flight fatigue so perhaps in an alternative timeline there is a Bremont Ilyushin Sturmovik collaboration with a blue dial! The brown dial works really well against the light tan strap fitted with the watch which looked and wore great but was slightly too thick for my personal taste. Sometimes squeezing it through the keepers was a challenge though overtime I'm sure it would soften. For those looking to fit a NATO strap onto the watch, I think the aviation style is very fitting (Dare I suggest that a leather bund might even look good!?) but I would be a wary of using thick leather straps as it will add even more height to a watch with an already high profile. Not that you could mistake the Boeing 100 for a vintage watch as the 43mm case and 22mm lug width dwarf any comparable pilot's watch from the 1950s and 1960s but it's important to remember that the Boeing 100 isn't trying to be a vintage watch. Its not attempting to be a re-edition of a past chronograph, instead it's more similar to the anachronistic 'what if' watches like the Tudor Black Bay or Omega Seamster 300. This pseudo-historical look might not be for everyone but give it half a chance and you'll be searching ebay for a pair of aviator sunglasses and a sheepskin bomber jacket before the day is out. Like all Bremont watches, the Boeing 100's case is constructed using Bremont's patented 'Trip-Tick' case construction method, whereby the movement is suspended inside an anti-shock chamber and surrounded by a multi-part case. Similar to the Ford Model T, you can have any color barrel you want as long as long as it's black. Fans of the multi-colored variety that the MBII offered might be disappointed but I felt that the neutral black compliments the watch well. The Boeing 100 is made from an aviation grade Titanium (Ti 6-4 Titanium to be exact) which is apparently stronger than the commercially used grade and is used in airframes and engine components in the aerospace industry. I doubt many consumers will be able to tell the difference in strength between different titanium alloys but I will say that despite the larger case size, the use of titanium kept the watch feeling light on the wrist throughout the day. The high profile of the watch might limit its wearability for some however, as someone who unfortunately has little reason to wear a suit in their day to day life, I found it an excellent daily wear because of the lightness. 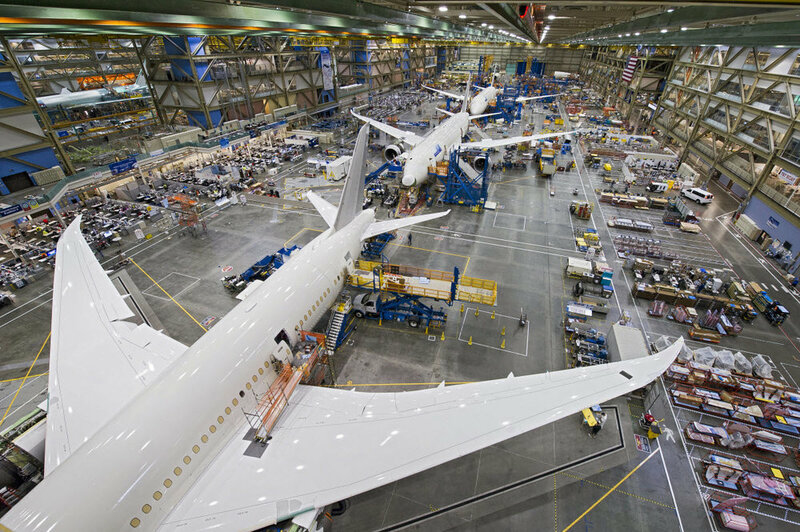 Along with the use of the aviation grade titanium in each of the 300 pieces, there will be a piece of carbon fiber composite from the Boeing Dreamliner ZA004 aircraft integrated into the crown. My sample piece only had a standard black crown however I can imagine the carbon fiber 'weave' will look really fantastic up close, another additional detail to be spotted by a diligent admirer or someone in the know. The Boeing Dreamliner is a modern aircraft that currently serves as an 'ecoDemonstrator' aircraft, a flying experiment that tests over twenty five different onboard green tech initiatives that attempt to improve gate-to-gate efficiency, reduce fuel consumption, emissions and noise. As someone who has unfortunately become an anxious flyer, I won't be impressed until the complete negation of all turbulence and an instant pretzel to seat pneumatic tube dispensary. The sixty minute bezel alleviates my only problem I had with the Bremont MBII-WH I wore back in August, the right hand placement of the crown controlling the inner bezel. I'm a lefty so whenever I wanted to quickly time something I had to contort my wrist in order to turn the crown but the Boeing's raised bezel made it easy for me to quickly mark time. A similar knurled finish is present on the screw-down pushers and crown and though I've never been a fan of screw-down pushers, I find them more of an inconvenience than anything else, the knurled engraving did provide a suitable grip to quick unscrew the pushers whether the watch was in my hand or on the wrist. Inside the Boeing is the Bremont Caliber BE-54AE which is of Swiss origin but was modified in Bremont's workshop in Henley-on-Thames. It runs at a standard 28,800 bph and has a 42 hour power reserve. As Bremont continues to focus on building as much as the movement as possible in England, I'd like to see them experiment with longer power reserves as 42 hours is edging closer towards the shorter end of the spectrum for luxury watches. (If you're interested in learning more about the rules behind movement origin claims, click here). Like the rest of the Boeing chronograph family, the Boeing 100 has a special addition of a skeletonized turbine inspired rotor. Like the use of the vintage Boeing logo, it's a really nice touch that again strengthens the aviation legitimacy without going overboard on the plane motifs. The movement is finishing with a standard perlage with some blued steel screws providing a dash of color. When activating the pushers, there was a touch more resistance than I expected and I look forward to when Bremont is able to provide the far smoother column wheel activation rather than the current CAM system. Not only will the experience for the wearer be superior, but the look of the column wheel would be a vast improvement over the slightly clunky architecture of the CAM. It's by no means a bad looking movement but it doesn't stir the blood nearly as much as chronographs in similar price points from other brands. I really enjoyed my time with the Boeing 100 though truthfully the MBII-WH is still the ace Bremont in my eyes. The Boeing's color scheme and size might make it less versatile but the GMT and chronograph complications were far more useful to me on a daily basis over the inner rotating bezel. If you're are a pilot or just interested in aviation history then I think the Bremont Boeing 100 would make a fantastic addition to your horological squadron.